These are the basic specs of my board. It is about 8″ x 9″, and has 248 holes. Even decades later, at work we still had to send out a physical Gerber tape, as there was no internet. And there would still be a lot of back-and-forth on the phone with the fabricators about anything that was strange or difficult. At least we had tools to do schematic-to-PCB checking, and some design rules. Fast forward to the present. Though we used to pay a whole department of people to oversee the PCB process – today, it is trivial. All the design was done on my $80 computer at home. Schematic matching and Design Rule Checking were automatic. No point in making a board at home, anymore, as I have money, and there are literally dozens of places on the internet that make boards. As the process is highly standardized and automated now, I have no fear of contracting the job out to the place with the lowest price, even if that isn’t nearby. Ultimately, I chose a place in China called pcbway.com . I had seen reviews of their product that showed low-quality silkscreening in some cases, poor alignment, and flaky communication. Further, they openly paid people for positive reviews (it’s offered on their website). However, I was able to rationalize myself out of the potential problems. The messed up silkscreen was in a case of someone ordering black ink on a white solder mask. I had everything very conservative and proven in my design. Regular green FR4 substrate. White silkscreen, green solder mask. 10/10 mil minimum trace/space. Only normal-sized through vias. I even had tooling holes in the corners of the board, although I suspected that they would neither need nor use them. The only unusual thing on the board is 2 oz copper, but even that isn’t so weird. 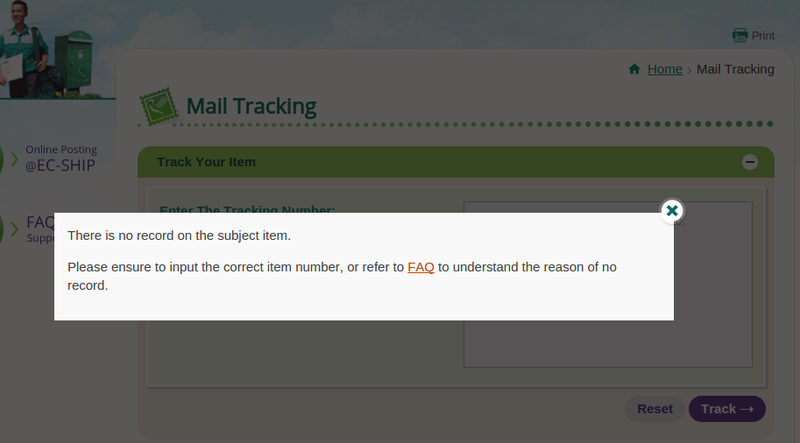 Before submitting the order, I asked a question on their contact form. It was about drill backoff errors in my design. I had pads that were smaller than the attached traces in some cases, which might have led to issues in the old days, when a manufacturer might edit the Gerbers to back traces off the center of the pads, leaving a visual target for someone to manually drill. After a day, a woman sent an email saying that it was a problem, and that I should fix the error, or she could have someone help me with it. After reading and re-reading her response, I decided that she hadn’t really understood the question or the issue, and just picked up on the word, “error.” After consulting with various people on the internet, I decided that these were not real errors, and proceeded to submit the order. For 5 boards, I’m paying $122 including shipping (by redeeming the $5 new-customer coupon.) That’s less than 36¢ per square inch, for a prototype run. Other Chinese vendors were in the sub-$200 range, but elsewhere in the world (including the USA), prices were two to eight times as much. The process is almost completely automatic, starting with a web quote and upload of Gerber files. The only human intervention in the interface was a 2-day wait for them to audit the files. They would not let me pay until the audit was done, and I paid almost immediately to start the job. Clicking on the link that says “Technological Progress” brings up the window in the next picture. No more phone calls to find out where the board is in fabrication. Their data entry isn’t perfect, as some steps appear to take negligible time. Still, it gives a good idea of how the board is doing. It took them two days to start after audit approval, and it looks like the factory runs 24-7. There are no emails or other notifications upon completing process steps, but I suppose that would just clog most people’s inboxes. Fabrication took two days, and the job was marked, “Delivery Ready.” The following day, it was marked as “Shipped,” with a tracking number provided. But trying to actually use the tracking number yielded the screen in the next picture. 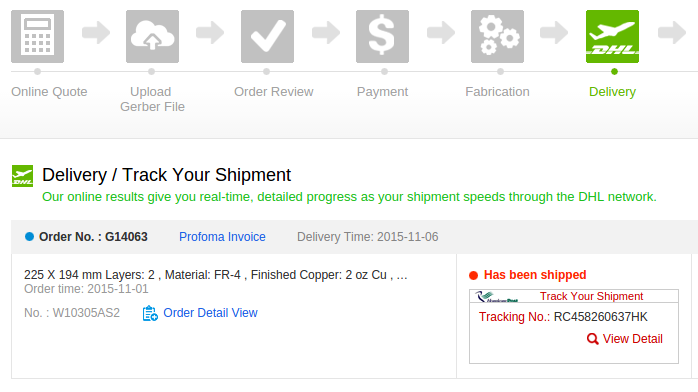 The default shipping method for pcbway was DHL, at a cost of $32. Actually, I had no need for quick turnaround, as I still needed to order additional components. So I elected shipment by Hong Kong Post for $24. The tracking number given does not work yet on their website, and from what I hear on the web, status may not be updated at all until the package arrives. 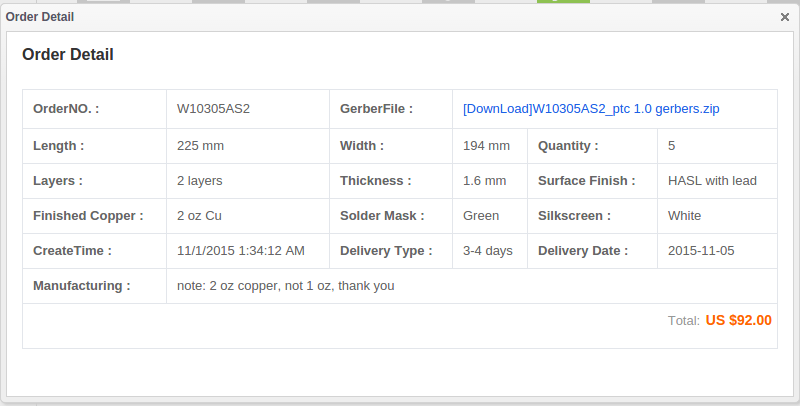 Shipping time was quoted as 10-25 days by pcbway. We’ll see. I’m not worried, yet. 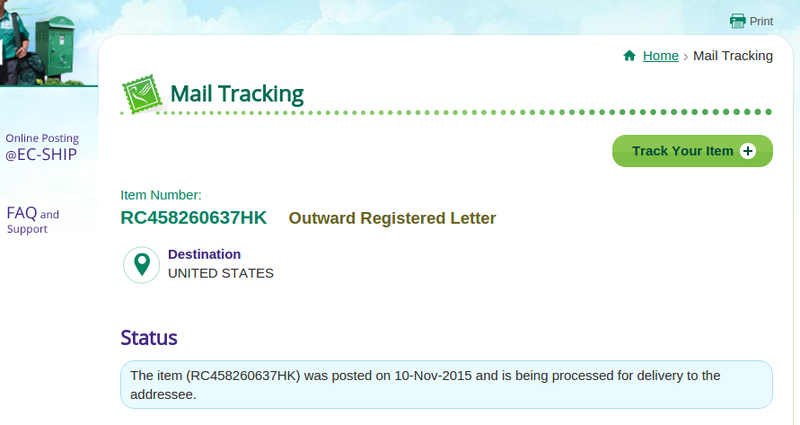 UPDATE, 10-NOV-2015: This morning, the HK Post site finally shows that the package was posted. I’d better get those orders in to Mouser and Digi-Key now for components, but I’m pretty sure the board will still be the critical path item. UPDATE, 11-NOV-2015: This was the status today. Hong Kong is a day ahead of my time zone, so possibly it already went out. UPDATE, 16-NOV-2015 8:50 AM: The package just arrived, signature required. That made the turnaround time from file upload, to package on my doorstep, 17 days, or 14 days from Paypal payment. I wasn’t expecting the boards for another 2 weeks, since I elected HK Post shipping rather than DSL. There are still components enroute from Mouser. In curiosity, I went back to the HK Post tracking site to see the status of my package. The site now once again says it has no record of the package. 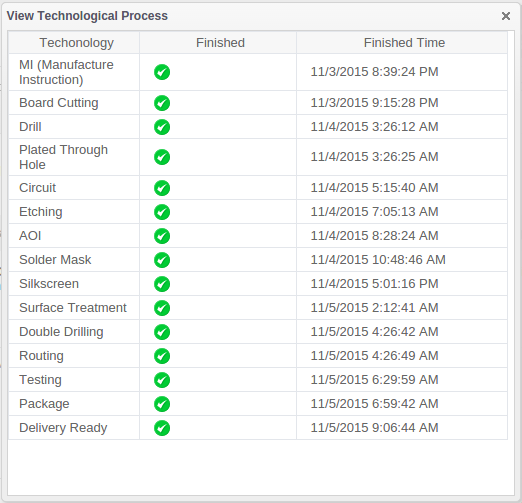 UPDATE, 18-NOV-2015: Yesterday, I opened the package and took a look at the boards. Posted a review of pcbway here.